For the past five summers I have enjoyed the challenge of painting outdoors. And I mean CHALLENGE! The eye, with its peripheral vision, encompasses all. The painter must choose a composition within that wide vista, and deal with constantly changing light, the passage of clouds, wind obliterating a reflection and numerous other conditions. But the biggest challenge of all is to render the impression a landscape imprints on your being. This past summer of 2014, was an especially prolific outdoor painting one for myself and artist friend Louise Jarry. The Jasper weather proved most clement and suitable for this pursuit. We often loaded a backpack with easel, folding stool, and painting materials to head on a trail in search of the perfect scenery. Or if less time was available, we just drove to a favourite location. 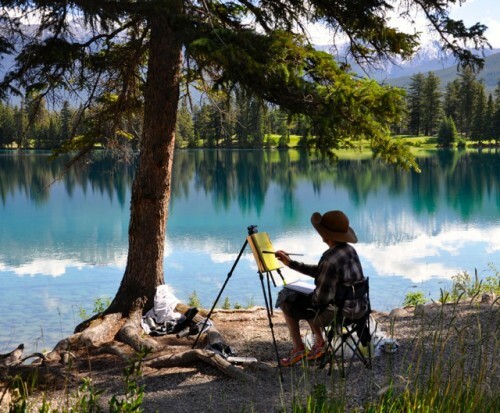 In June Jerry Markham offered a plein-air painting course in Jasper, which I indulged in. Watching another artist’s approach is so worthwhile.